Reading, MA, June 6, 2016 – The Reading Fall Street Faire is slated for Sunday, September 11 from 12 – 5PM, and will feature a special program at the beginning of the Faire to commemorate the 15th Anniversary of September 11th. The Fall Street Faire Committee Chair, Brian Snell, commented, “The Committee is hard at work to plan another successful community event. The Fall Street Faire is our way to kick off the fall and showcase downtown Reading.” This event boasts large crowds and is family friendly, with many activities that are free or low cost. Vendors on the Faire Route may register now, with general registration opening on June 15th. 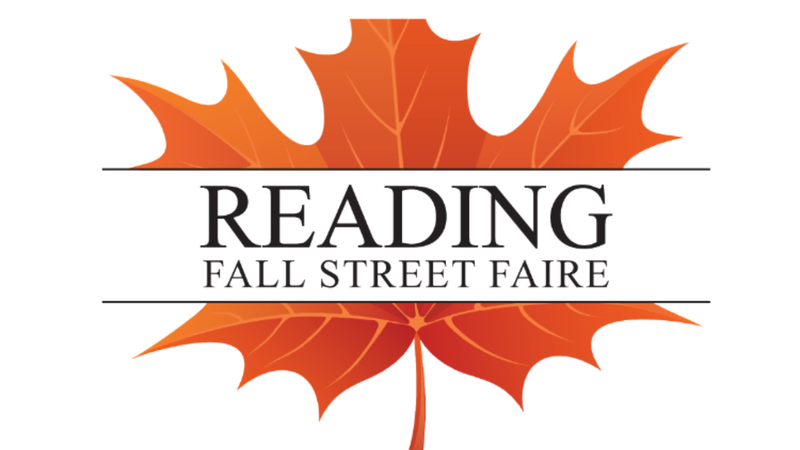 Vendors are placed on a first-come, first-served basis so make sure to register http://www.readingfallstreetfaire.com promptly to secure a prime spot. The afternoon will begin with a ceremony to mark September 11th with bagpipes and drums played by Irish American Police Officers Association along with the honor guard. This year’s event will feature two stages, live entertainment, music, food and food trucks and unique vendors. Kids can enjoy additional inflatable structures and children’s activities, a “touch a truck” area where families can explore trucks and construction equipment and more. The day will begin with Reading’s “Green” 5K sponsored by PureFit of Reading. The Fall Street Five-K is a community-based road race open to both children and adults. Registration for the race will open in July. A pre-race warm up will be offered by PureFit Reading Staff. The race will be held in the morning on September 11 in advance of the Fall Street Faire, and it begins and ends at Washington Street Park, located at 100 Washington Street, Reading. An awards ceremony will be held at the park immediately following the race. For further information contact Chamber of Commerce Executive Director Lisa Egan at legan@rnrchamber.com or 978-664-5060, or visit the Fall Street Faire website at http://www.readingfallstreetfaire.com. MEDFORD PUBLIC SCHOOL STUDENTS WIN AWARDS IN ITALIAN!